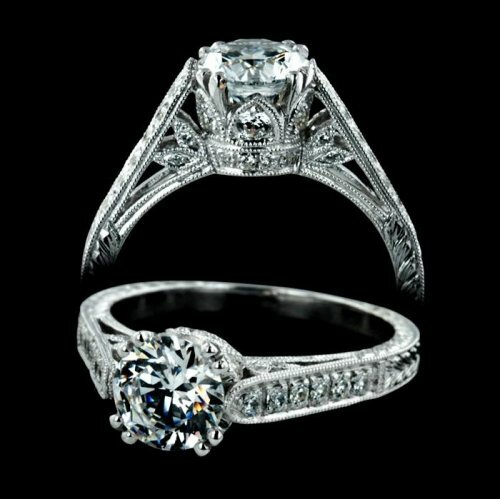 This is an absolutely beautiful and exotic antique style engagement ring. Featuring an eye catching natural enhanced 1.01 Carat Brilliant Round Center Stone, VS2 Clarity, G Color. Flowing gracefully down the shank are an additional .45 tcw of diamonds on the band and undercarriage. Set in luxurious 14kt White Gold. This intricately designed ring and unique crown brings back the style and character of the Edwardian time period. This ring is truly fit for a Princess! Center Stone can be upgraded to a larger stone for an additional charge.